We all know how important sleep is, and that’s the very reason most people are willing to spend thousands of dollars on the best mattress. As an adult, you’ll know just how bad things can get if you don’t get ample zzz’s, so just imagine how vital sleep can be for newborns. In fact, newborns need up to 17 hours of sleep (8-9 hours during the day, and another 8 hours at night) to stay in top shape and remain healthy. Ensuring an infant’s sleep shouldn’t be that difficult. Most techniques that apply to you will also apply to them. A quiet room, optimal temperature, a dry nappy, full stomach, and a comfortable sleeping surface will all help them doze off easily. If you’re ready to shell out big money for the mattress you sleep on, you should be ready to do the same for your baby's crib mattress. Having won the America's Best Brand for Baby and Women's Choice awards four years in a row (2013-2016), the Sealy Soybean Foam-Core Mattress is definitely worth checking out. 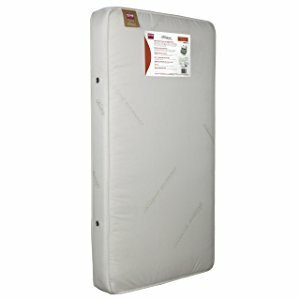 You can be sure of its quality, since it is made by one of the biggest names in the mattress industry.. 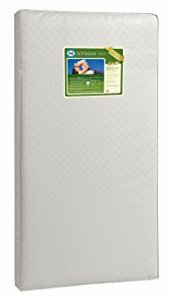 This foam mattress takes pride in its Greenguard Gold certification and use of CertiPUR-US-approved materials. 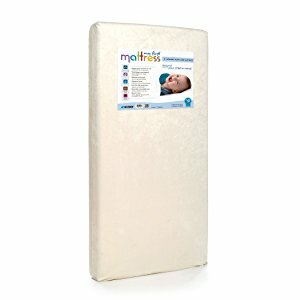 If you want the safest and most environmentally friendly mattress for your baby, this is a good option. What's Great About It: What sets this product apart is its use of soybean foam for its core. This renewable material is a popular bedding option, as it is hypoallergenic and very eco-friendly. It’s also very durable, so you can count on it to last for years, even with heavy use. In terms of comfort and safety, it’s very firm and fits most standard-sized cribs perfectly so you don’t have to worry about your little one’s time in her crib. Since it doesn’t use harsh chemicals, you can count on it to be a healthy choice for most households. Check out this Moonlight Slumber product if you want to get more use out of your baby's crib mattress. The Little Dreamer is not just meant for infants and newborns, but because its other side is equipped with a softer surface, it can be easily used for toddler beds, as well. Aside from its practical design, the Little Dreamer is also loved for its non-toxic construction. Made with a plant-based foam on the firmer infant side and plusher high-density foam on the toddler side, it offers great comfort for your little one for years to come. What's Great About It: While it’s not an all-natural product, it has taken strides in avoiding the use of harsh chemicals. It’s free of lead, phthalates, vinyl, polyethylene, and PVC, so you can rest assured that it won't harm your little one’s health in her sleep. It’s also GreenGuard Gold-certified, further making it an excellent choice for your baby’s safe and sound slumber. I also chose this product as one of the best crib mattresses because of its nice cover design, which is a combination of a woven fire barrier and a medical-grade, stain- and water-resistant, antimicrobial cover. It’s also very easy to clean, so you won’t have to worry about keeping it clean and safe for your baby to use. Combining safety and great support is the My First Premium Memory Foam crib mattress. 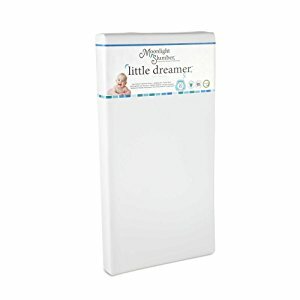 Like the Little Dreamer, this is also a dual-firmness crib mattress as it has a memory foam layer on one side and a polyurethane surface on the other. This design makes it ideal for infants, toddlers, and your budget, as it can last for a few years without a hitch. Made from flexible premium CertiPUR-US-certified polyurethane foam, this product is firm, yet supportive at the same time. Even mom and dad can sleep comfortably in it. However, it does use memory foam, so you need to spend some time airing it out to get rid of the residual scent. Despite its choice of materials, it has also exceeded the safety standards set for crib mattresses in terms of flammability. This guarantees its safe use, so you can rest assured that this affordable option won’t endanger your little one’s health. What's Great About It: Made without the use of harmful chemicals as fire retardants, this product is guaranteed to be non-toxic, as it is formaldehyde-, mercury-, and lead-free. It also has a very soft velour waterproof cover, guaranteeing great comfort for your baby. Some parents aren’t really fond of foam mattresses, even if they are non-toxic. This is mostly because memory and polyurethane foam always use chemicals, which a lot of parents aren’t willing to expose their little ones to. As an alternative, Naturepedic’s innerspring crib mattress has become one of the top models in the market today. Providing cushioning for this mattress is 100% US-grown organic cotton filling. This makes it free from chemicals and foam materials, making it a true blue organic mattress. It’s also hypoallergenic. What's Great About It: Despite its unique construction, you don’t have to worry about cleanups, as this mattress makes use of food-grade polyethylene, making it waterproof, but completely free of harmful chemicals. It also has a dust mites barrier and a GreenGuard certification, ensuring its safe use. As it’s also designed with dual firmness, your little one can use it until he becomes a toddler, making it a pretty good investment. 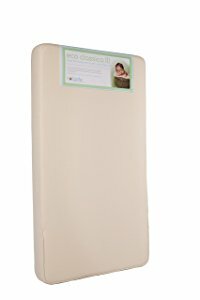 Another popular option for a crib mattress is the Colgate Eco Classica III. Since it is made by one of the most respected brands in the industry, it’s a no-brainer to include this mattress on this list. Featuring an orthopedic style, it guarantees great firm support that your little one can use until their early toddler years thanks to its dual firmness design. Made of ecofoam with plant oils, it’s guaranteed to be environmentally-friendly and composed of natural materials. While it weighs 10 pounds, it’s still very manageable, and substantial at the same time. What's Great About It: Certi-PUR-US- and GREENGUARD Children & Schools-certified, this product also takes pride in meeting the highest standards in ensuring children’s safety and indoor air quality. 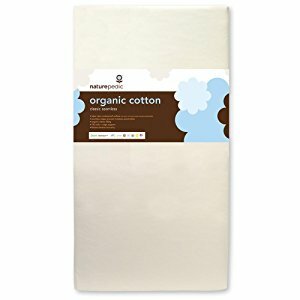 I also love its organic cotton cover that guarantees safety for your child’s skin. If you’re worried about moisture and other bodily fluids seeping into the mattress, fret not; the covers are lined with waterproof material, preventing liquids from getting into the core of the mattress. This makes it more hygienic and easier to maintain, as you’ll only need to wash the cover to ensure the mattress’ cleanliness. Foam mattresses are notorious for their scent, but the Eco Classica II doesn’t have any residual smells, which is a great plus in my book. You’ll be pleased to know that this product doesn’t have to be aired out before use, and you won't have to worry about harmful off-gases. Being on a budget doesn’t mean that you should skimp on your baby’s comfort and safety. This is why, if you’re not ready to spend hundreds of dollars on a crib mattress, Safety 1st’s Heavenly Dreams crib mattress is something you should consider. This is another product with dual firmness, so you can stretch your baby bed budget even more until your little one’s toddler years. Equipped with a high-density thermo-bonded fiber core, it offers fantastic firm support for your newborn. Flip it to the other side, and your toddler will be able to get a great sleeping surface with ample back support. 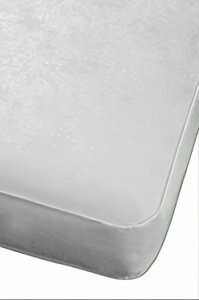 What's Great About It: Lead- and phthalates-free, this lightweight foam mattress is also GreenGuard-certified, so you can be assured that, even though it’s generally not as expensive as the other items on this list, it still meets safety standards. I also love that it’s perfect for most standard-sized cribs, so you've got every base covered when it comes to your little one’s safety. Topped with a water-resistant vinyl cover, it’s also very easy to clean. All you need to do is wipe it down and call it a day. Affordable and fuss-free, this budget crib mattress can be a good option for practical parents. As it can already do as good a job as its pricier competitors, you can bet that a lot of parents love this product. Another innerspring option for your little one’s crib mattress is the Simmons Kids Beautyrest Beginnings. It promises the same quality, support, and performance as your beloved full-sized Beautyrest mattresses, making it a solid choice for parents who have fallen in love and soundly asleep with the Simmons brand. Think of the Beginnings as a luxury mattress for your baby. With its 231 pocketed spring coils, your little one can enjoy excellent support and firmness like no other. It also has a 100% natural cotton wrap with fire protection, making it non-flammable and compliant with federal laws, without having to use harmful chemicals. This makes it perfectly safe and comfortable, even for a newborn. To top it all off, it’s also designed with dual firmness, so your child can use this mattress well into their toddler years, giving you more value for your money. What's Great About It: I love the details added to this wonderful mattress. The Innofoam corner protection, combined with the reinforced border edges, make it a safer sleeping surface for your child. It won’t easily give under your child’s weight, even if he sits, stands, or rolls to the side. This can prevent his limbs or head from getting stuck in gaps, guaranteeing the utmost safety. If you appreciate the use of technology in the mattress industry, then you’ll love the Newton Crib Mattress as much as I do. Also known as the Newton Wovenaire, it’s touted as a “better than organic” option because of its choice of materials. It’s also recommended by many pediatricians, making it a legitimately good choice for many first-time parents. Award-winning and completely washable, you’ll actually find its price easily justifiable because of how promising this product is. It stands out from the crowd because of how unique its construction is. This product is completely organic, as it’s only made of two materials: Wovenaire and a 3D spacer cover, making it 90% air and 10% polymer. You might want to look up how this product is made, because it’s a really interesting process. What's Great About It: Wovenaire is a revolutionary material that’s breathable and safe. Made to replace foam, it’s actually composed of 100% recyclable food-grade polymer, so even you can safely eat on it. As it’s 90% air, it’s very breathable. You can basically breathe through it, so it's a perfect option for little stomach sleepers. Just pair it with highly breathable and snug-fitting sheets, and you’re good to go. I also love that this product is completely washable. Not a lot of crib mattresses can withstand being actually washed, because they won’t dry out thoroughly, making them inviting breeding grounds for mold and mildew. You can basically scrub this whole thing down without worrying whether it will dry completely, so it really makes for an excellent alternative to traditional units. As it doesn’t use any kind of foam that might also double as allergens, it’s also a completely healthy option for kids with specific sensitivities. Most of the mattresses on the list promise to be healthy options for your little one, and most of them really are fantastic choices. It’s actually entirely up to you which one to go for, since different kids have different sensitivities and particularities. 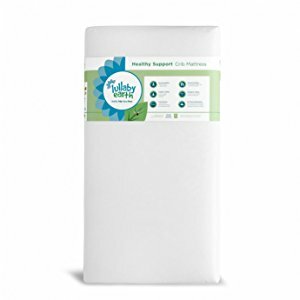 The Lullaby Earth Healthy Support Crib Mattress is one great example, as it is deemed a non-toxic pick. Award-winning and made in the US, the Healthy Support is well-loved by many for being a healthier alternative to regular mattresses that expel harmful gases and chemicals. It’s made of 100% food-grade polyethylene, making it completely safe to sleep in, or even eat off of. Like most of the other items in this list, this product is also available in a dual-firmness option. This ensures that your child will be able to use it until his toddler years, stretching your dollar to its limit. As it also comes with a very friendly price tag, it’s definitely worth every penny. 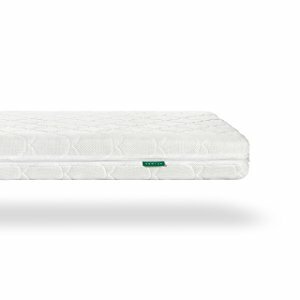 What's Great About It: There are a few notable things about the Lullaby Earth Healthy Support crib mattress. For one, it has firm edges, which make it perfectly safe for your little one. This design makes it impossible for the sides to give when weight is put on it, ensuring that your child won’t get trapped in between the crib and the mattress. While it’s not exactly all-natural, it still doesn’t contain harmful materials like PVC, vinyl, or polyurethane that often outgas toxic smells that can affect your baby’s health and development. Three, it has no chemical-based fire retardants. It makes use of wood pulp, baking soda, and the same kind of hydrated silica that’s found in our bodies to make the mattress non-flammable. For parents who are on a tight budget, paying hundreds of dollars for an item that will be only used for a year or two may seem impractical, so finding a more affordable alternative is important. 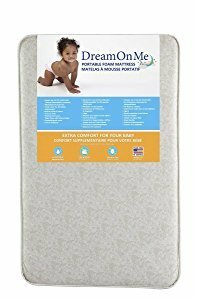 Dream On Me’s Foam Pack and Play Mattress is a versatile and affordable option, making it the perfect addition to our list. As the name suggests, this product is not just for your little one’s sleep. You can easily take it out of the crib to use it as a cozy surface on which your baby can play during the day. This will give you more bang for your buck. What's Great About It: Designed for versatility, you can be sure that this mattress can be in use at any time of the day. For one, it’s light weight makes it very easy to lug around. It won’t break your back to move it from the crib to the living room, as it only weighs 2 pounds. Its waterproof, wipe-clean, hypoallergenic cover is also a great plus, ensuring proper hygiene and your little one’s good health. Everyone, regardless of age, needs to be comfortable to sleep well. However, this need is amplified for infants and newborns, as they really can’t handle stress and discomfort that well just yet. Sleep also plays a huge part in their physical and cognitive development, so you really have to meet their sleep requirements if you want them to be in top shape as they grow. Their sleeping surface has a great effect on the achievement of all of these, so it’s vital that you pay close attention to which mattress you get for their crib. Why, exactly? Allow me to elaborate further on the importance of the best crib mattress for your little one. The most pressing concern when it comes to crib mattresses is the alarming danger of SIDS, or Sudden Infant Death Syndrome. Also referred to as “crib death,” this condition is the unexpected death in seemingly healthy infants and newborns during their sleep. While this condition is more of a blanket term for the many things that can go wrong in a young child’s body during sleep, it is also used to describe deaths caused by the baby’s sleeping environment. It caused 1,600 deaths in 2015 alone. 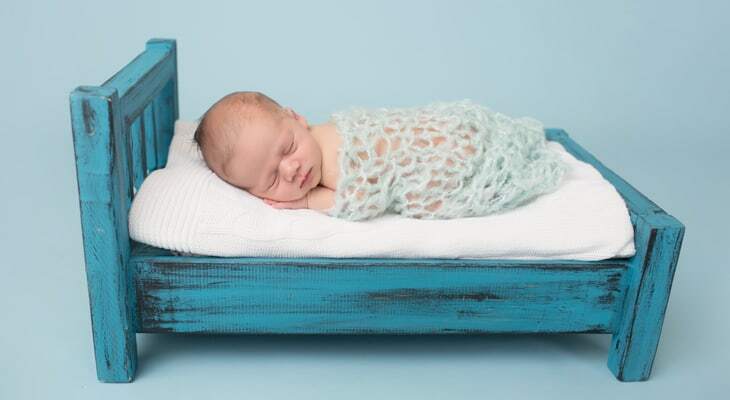 Aside from medical problems, SIDS can also be caused by suffocation, which can be a result of sleeping on a soft surface, in the wrong sleeping position, in a crowded crib, or sharing the bed with parents. Because a baby can’t really move independently and control her body to its full capacity, a soft mattress can cause your little one to sink into the mattress and potentially find her face pressed into the soft “walls” that her weight has created. As she can’t really shift to correct her position, this can cause suffocation, and even death, when not dealt with immediately. The same goes for sleeping in the wrong position, so experts reiterate that young kids should always be put down in their crib with their backs on the mattress to ensure safety. Bedsharing is strongly discouraged by pediatricians. While they do recommend that parents and infants sleep in one room, they still have to be in separate beds to lower the risk of SIDS. Crib mattresses should be firm so their surface won’t conform to your baby’s face and cause suffocation. It will also help babies to stay in one position, so they won’t find themselves face down in the mattress with a limited oxygen supply. Because babies can get trapped in spaces without being able to correct their positions on their own, you should lessen such risk by getting a mattress that perfectly fits their crib. This will guarantee that their little arms, head, or legs won’t get caught in the gap. You wouldn’t want to put your baby in something that will easily get damaged, so make sure you choose a quality mattress as well. Just like in full-sized mattresses, you also have tons of different options when it comes to crib mattresses. You can opt for spring coil or foam mattresses, depending, of course on your preference. Whatever kind you buy, though, make sure that it’s well-ventilated so your child won’t sleep on a hot surface, especially during warm summer nights. A dirty mattress can also cause illness. Allergies and other infections can be contracted from an unhealthy sleeping surface, as your little one will be in close contact with it for hours, so you also have to be very particular about the cleanliness of the mattress you’re getting for your little one. It is mandated by US law that all crib mattresses must be flame-retardant to protect your little ones. However, this has pushed manufacturers to use chemicals to reduce their products’ flammability. This can have other adverse effects on your child, so you have to be careful when shopping for a crib mattress. To help ensure your baby’s safety, here are a few more details that you should know about crib mattresses. A new mattress is cleaner. A used mattress will already have discarded skin, mold, dried urine and other bodily excretions, bacteria, and debris. All of these will pose additional dangers to your little one. A used mattress might already have lost its shape and integrity. It might have already lost its firmness, making it insufficient for your baby’s needs. It might also already have springs popping out or a bent frame, so it might bring discomfort to your child instead of ensuring her great slumber. No one wants to sleep on a sagging mattress, and you can bet that your baby will feel uncomfortable in one, so it’s just best to skip used mattresses altogether. Q: How perfectly should the mattress fit inside the crib? A: As you might already know, the government has standard sizing in place for full-sized cribs to ensure your baby’s safety. As for mattresses for full-sized cribs, they should be about 6 inches thick and 27 ¼ inches by 51 ¼ inches in size. However, as some manufacturers don’t really give out their exact measurements, buying a crib and mattress separately can be quite tricky. Therefore, what I recommend is to test the product out. If you can squeeze in two fingers between the mattress and the side of the crib, it’s too big and will be dangerous for your little one to use. Q: What kinds of materials are best for crib mattresses? A: If you can keep away from products made with harsh chemicals, you’ll have a better chance of bringing home a safe crib mattress. However, you should also keep in mind that just because a product is all-natural or organic, that does not mean that it won’t get dirty or trigger allergies. It still depends on your child and whether his system has adverse reactions to certain ingredients, so you have to pay attention to that as well. Q: How do I keep my crib mattress clean? A: Using a waterproof and easy-to-clean mattress cover is a must to keep your baby’s crib mattress in good shape. Keep in mind that the cover should fit tightly so it won’t find its way to your baby’s face and cause suffocation. Q: Will swaddling help minimize the risks of SIDS? A: Studies have shown that swaddling does not significantly lessen the risks of SIDS. Also, if you’ve already cleared your baby’s crib of stuff that she can grab and that can potentially get on top of her face, you might not really need to swaddle anymore. Choosing the best crib mattress for your baby isn’t just about your baby’s comfort, but also his safety. This is why it’s imperative that you don’t settle for anything less than perfect for your baby’s sleeping surface. I hope my list gives you a few good ideas for which products to choose so you can quickly find the perfect solution for your baby’s safe and quality slumber.